No other company in America was as intimately tied to the Obama Administration and the Democratic Party during Barack Obama’s eight years in office than Google. Today the company is doing everything it can to restore the same cozy White House access it enjoyed under President Obama. 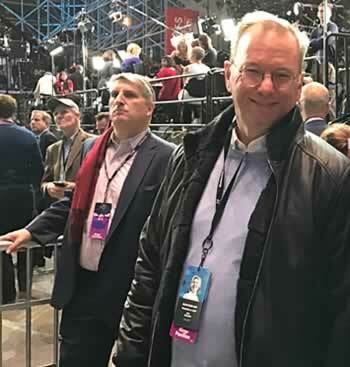 Eric Schmidt has attended at least two meetings with Trump and attended a third White House meeting with tech leaders last Monday. At the same time, The Groundwork – a secretive Schmidt-funded startup that ran the Clinton campaign’s data operation – recently relaunched itself as a technology platform for liberal organizations working to fight the Trump Administration’s agenda. By all appearances, Google appears to be working overtime to both ingratiate itself with the Trump Administration while simultaneously cashing in on the “resistance” to Trump’s agenda. CASHING IN ON THE "RESISTANCE"
November 1, 2016: Hacked emails reveal that Eric Schmidt plays a key role in Hillary Clinton’s campaign, providing strategic advice on the campaign’s technology operation and funding a secretive startup called The Groundwork to provide data analytics for the Clinton campaign. November 8, 2016: Schmidt spotted at Hillary Clinton election night victory party wearing a Clinton campaign “staff” badge. November 10, 2016: Schmidt congratulates President-elect Trump: “I think we should congratulate the next President of the United States. November 15, 2016: Google CEO Sundar Pinchai says that fake news bankrolled by Google-served ads may have swung election results in President-elect Donald Trump’s favor and that the company will remove fake news sites and stories promoting fake news. November 30, 2016: Schmidt participates in new funding round for Democratic analytics startup Civis Analytics. December 7, 2016: Google looks to hire a conservative outreach manager to act as a liaison to conservative groups. 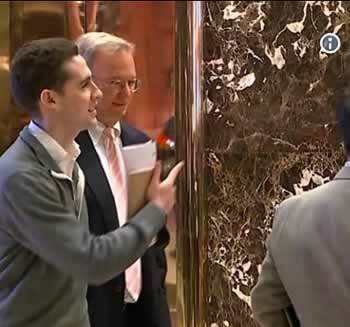 December 14, 2016: Alphabet CEO Larry Page and Schmidt meet with President-elect Trump. January 4th, 2017: Google hosts party for Republican lawmakers at the Smithsonian Arts and Industries Building. January 12, 2017: Schmidt meets with Republican Congressional leaders, Trump’s economic adviser Gary Cohn and Treasury Department Steve Mnuchin. January 12, 2017: Schmidt attends a private lunch with Jared Kushner. January 13, 2017: One day after Schmidt’s meeting with Kushner, Google donates $285,000 to the Trump Inaugural. January 25, 2017: Google parts ways with Democrat lobbying firm, The Podesta Group. January 26, 2017: Google lawyers urge Senator Diane Feinstein to oppose Jeff Sessions for Attorney General. January 27, 2017: Google CEO Sundar Pinchai slams President Trump’s immigration order in a note to employees. January 28, 2017: Google founder Sergey Brin joins protest against Trump Administration immigration order at San Francisco airport. January 30, 2017: Google employees stage a walkout to protest President Trump’s immigration executive order. 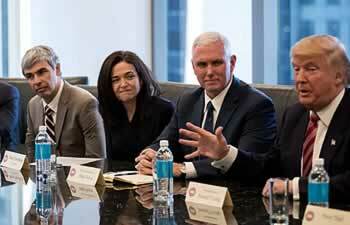 February 1, 2017: Google signs on to Silicon Valley letter opposing President Trump immigration ban. March 6, 2017: Google hires Republican Senator Ted Cruz staffer Max Pappas to head the company’s Republican political advertising. March 7, 2017: Google hires Republican consulting firm Luntz Global to help with messaging and outreach to the Trump Administration. March 16, 2017: Google backs away from the legal fight against President Trump’s immigration travel ban after declining to sign on to a legal brief seeking to block the second version of the President’s executive order. March 22, 2017: Schmidt criticizes President Trump’s proposed cuts to science funding and immigration policy. May 28, 2017: Schmidt praises President Trump’s son-in-law Jared Kushner for several of his policy initiatives. May 29, 2017: One day after Schmidt praises Kushner, the Trump Administration announces plans to disband a Labor Department division investigating Google for its compensation policies regarding women. June 19th, 2017: Schmidt scheduled to attend American Technology Council summit meeting with President Trump.